Kiplinger has rolled out an online MPG (miles-per-gallon) calculator for consumers who are shopping for 2007/2008 model year new vehicles. The calculator, according to Kiplinger, is based on EPA’s revised fuel efficiency estimation rules, which will be applied on all vehicles manufactured after September 1, 2007. I used our Honda Odyssey to test the calculator and found the numbers the calculator gives are exactly the same as those I got from EPA. The 2007 model still uses old standard, thus the MPG numbers (for both city and highway) are higher than those of 2008 model which are estimated following new EPA rules. And the calculator also shows vehicles with the best and worst MPG in the same class to give you an idea how the vehicle you are interested in compared with others. For example, in the minivan category, it shows Toyota’s Sienna scores the best MPG, while Buick Terraza has the worst fuel efficiency record. Another website to find comprehensive fuel efficiency data and compare MPG between different models is FuelEconomy.gov, a Department of Energy website focusing solely on fuel economy (vehicle MPG calculation and comparison, gas mileage tips, and fuel efficient vehicle information). 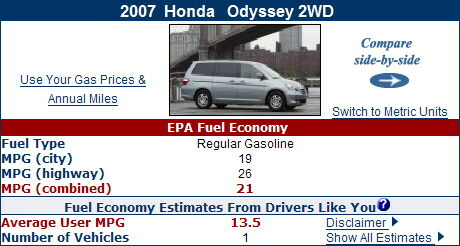 For the 2007 Honda Odyssey, the MPG estimations are the same as above. Yeah, the 2008 numbers for my Honda Ridgeline are much closer to what I’m actually getting for my 2006 Ridgeline. In full highway driving at 10 over the limit, I MIGHT get over 20 mpg. My mileage of late has been about 16-17mpg mixed city/highway.